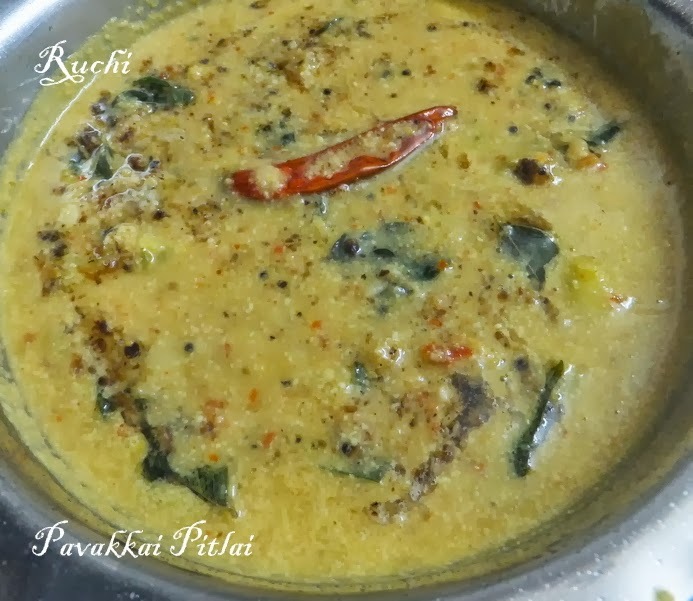 Pavakkai /Pakarkaai Pitlai (Bitter gourd Pitlai) is an authentic recipe made in our home. Pitlai is kind of a cross between sambar and kootu. I used to make Pitlai in any one of these veggies (green tomato, katharikai- eggplant, Pakarkaai & Ladies finger).The combination of Thoor dal ,tamarind pulp and spicycoconut paste gives tangy with coconut flavor gives the unique taste and reduce the bitterness of this vegetable. The pitlai is easy to prepare and quite healthy and served along with steamed rice and ghee .But the classic combination for pitlai is with morkuzhambu! It is one of our favorite dish.I often make this pitlai. 1.Slit the bitter gourds and remove the seeds. Cut it into small pieces. Sprinkle little salt and mix well. Keep it aside. 2.Soak tamarind in water and extract thick pulp, drain the pulp and set aside. 3.Pressure cook the toordal and smash it and keep it aside. 4.Pour the oil in the pan and fry the red chillies, coriander seeds, channa dal till its turn golden brown color then add shredded coconut and turn off the stove. Let it cool down and grind it to a paste. 5.Cut bitter gourd into small pieces. In a vessel pour the tamarind extract; add the bitter gourd pieces and squeeze out all the water and add turmeric powder and salt. Bring to boil. Till the raw smell of tamarind goes and the vegetable is cooked. 6.Once the vegetable is cooked add the mashed dal and stir well. Bring to boil. Then add the spice paste and allow boiling for about few mins. Add water by checking for consistency. Remove from heat. 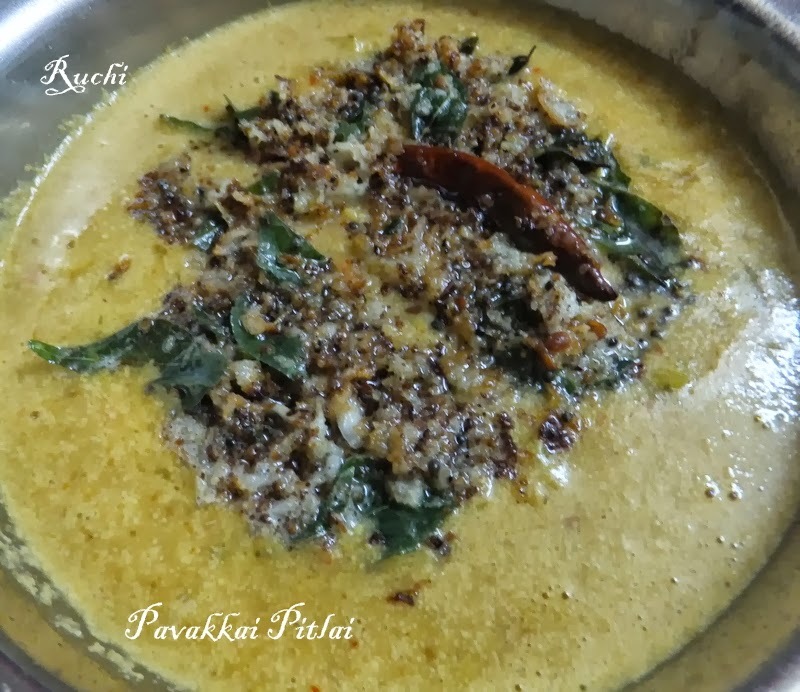 7.For seasoning, in a teaspoon of oil, pop mustard seeds, add urad dhal, asafoetida, coconut and curry leaves, saute till golden colour and add it to the Pitlai. 8.If you desire, you can add a small piece of jaggery to lessen the bitterness. 9.Yummy Pavakkai Pitlai is ready. Goes well with steaming hot rice and ghee/morkuzhambu and pappad. Traditional and delicious recipe.. looks great!! Wat a wonderful dish, my all time favourite pitlai..